Here good news for Vodafone users🤩. 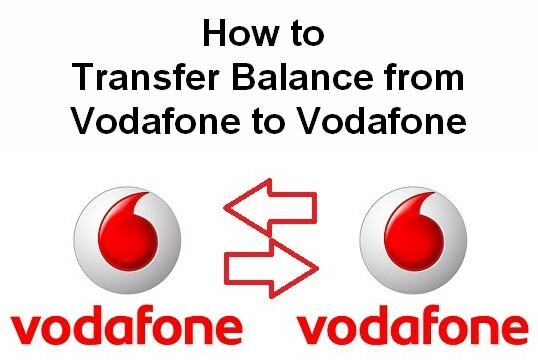 Today here I will explain how to transfer mobile balance in Vodafone. This service is more useful when we do not have enough balance to call someone😫. Even it’s a very simple and there is no need to put any efforts🏋. But this process is only possible when both transmitter and receiver using same mobile operator otherwise you cannot share with your family 👪or friends👫👭. The balance transfer is the service provided by the telecom operators to the users using which they can share the amount in their mobile account. It can be done without the need for an app or internet. Vodafone ussd codes *131* can be used for this purpose. The thing to note here is that there is a balance transfer fee involved in this process. What you need to do is simple dial Vodafone balance transfer code then enters the amount how much you want to share and next enter the mobile number. How simple it was. If in case you do not have an idea just follow here step by step. Here I will give you full information about transferring a mobile balance from Vodafone to Vodafone. You can only share your balance once in a day but the receiver can receive multiple times. Imagine a situation where you are out of mobile balance and you need to make an urgent call. Now you do not have any service which can help you to recharge. In that case, if another Vodafone user is present then he can send some amount from his or her account to your account. Once the transfer is complete you have the talk time to use and make calls as you want. The minimum balance should be 5 rupees and maximum should be 30 rupees only. The transmitter should be activated since at least three months before and the receiver must be activated since one month before. While doing this process both transmitter and receiver mobile numbers should be in active mode. You must also check my Vodafone unlimited free calling trick, Vodafone free internet trick, Vodafone free recharge trick, Vodafone loan code and Vodafone Red Plan. What you need to do is a simple search and find out the Vodafone USSD code for transfer mobile balance. Also check List of All Vodafone USSD Codes, How to Carry forward Vodafone Unused data, and how to take internet data mb loan in Vodafone. Even it does not take so much time. Simple you can transfer within five minutes. Now you have learned How to transfer the balance in Vodafone. Now, remember this Vodafone Balance transfer code and next time your friend need balance, just transfer it to the above trick.